At the risk of sounding vapid, whoa, this book is a total downer... Winner of, like, a zillion awards (including the Pulitzer! 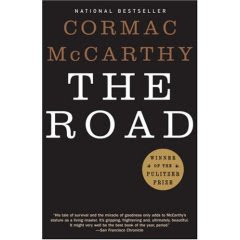 ), The Road is a post-apocalyptic tale about a man and his son as they wander around the United States trying to survive from cannibals and the elements fueled by canned goods and their fierce love for each other. The themes of love, God, morality and mortality all tie in together into one seamless piece. McCarthy's work is dark and his imagery is brutal at times (lots of dead bodies everywhere), but it's still an oddly beautiful book. Depressing as all hell, but a powerfully moving read.